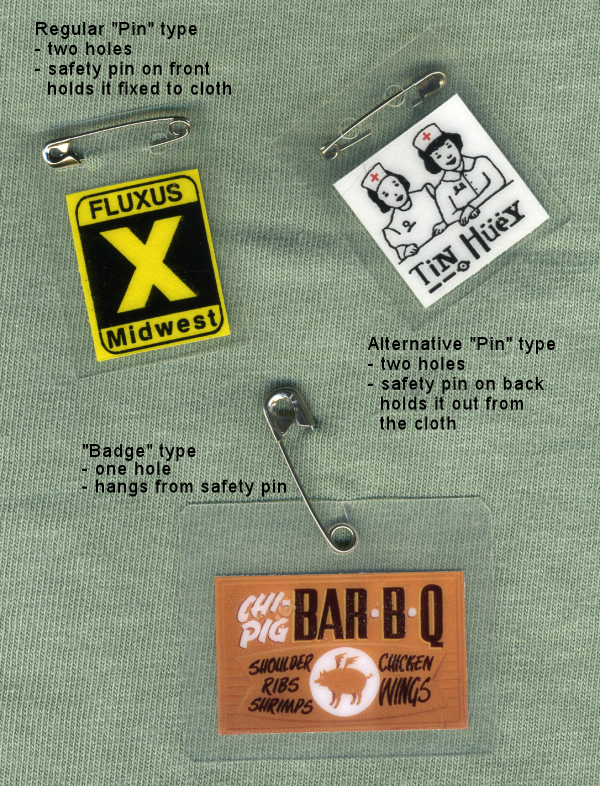 Learn how to make your own laminated pins & badges. We're assuming you are capable of doing this without our help. If you can't think of a single image or idea for making a button, then go here. Depending on the the size of the image you have and the size of the button you want to make, you may want to crop or resize the image (using computer, scanner, copy machine, etc). 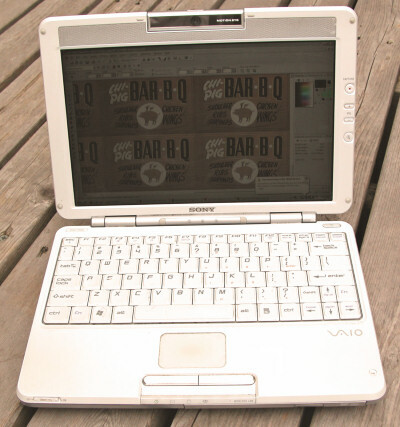 The modern way to create an image is to do so using a computer and a graphics software program. The great thing about using a computer to create your image is that you can create a large image (which can be easier to work with) and then 1. reduce the size of your working image to make it as small as you'd like and 2. easily make and print out multiple copies. 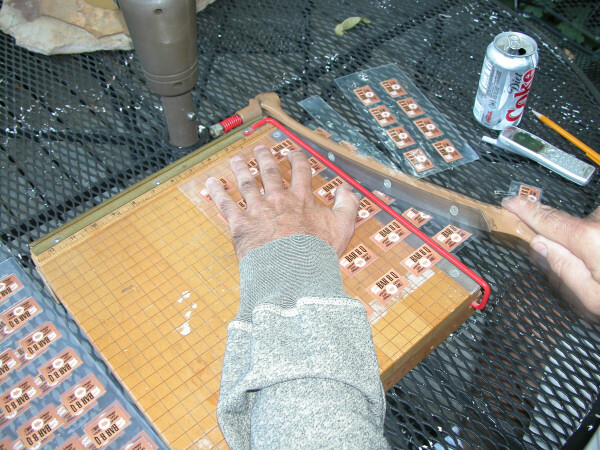 Here I am using my old "guillotine" cutting board to cut a master sheet of 16 (4 x 4) pin images. I trim the sheets, then cut them into rows, and then cut the rows into individual pieces of paper. You don't have to use a cutting board (and if you do, you'll probably want to use a more modern and less dangerous one than this). Of course, you can also just use scissors to cut out the pieces of paper. If you like straight edges, however, your going to want to use a cutting board or a ruler and razor knife. Using a cutting board seems to be the quickest and most efficient way to cut up a lot of pieces of paper. Cutting the paper pins up as precisely as you'd like may take some practice, however, so always be prepared to screw up and waste some of your paper pins during this part of the process. Buy your own double sheets (also called "pouches") of thermal laminating plastic from an office supply store (like Staples) or a copy center (like Kinko's--now FedExKinko's). These sheets/pouches come in various thicknesses. I like to use 5 mil or 10 mil thick laminating plastic -- otherwise the little pins and badges are not strong or durable enough for my tastes. Your own preferences about this may vary, so try out various thicknesses before committing yourself to buying a box of pouches. 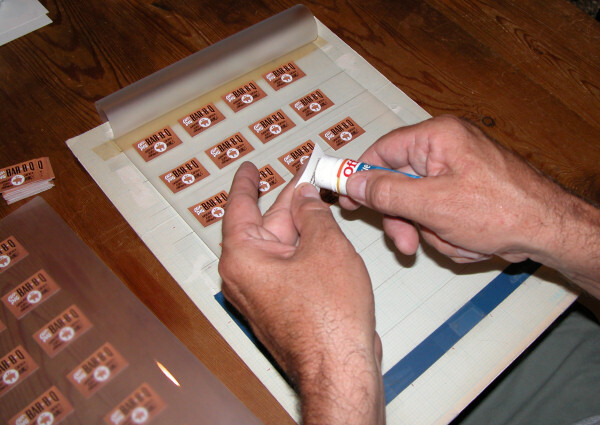 Here I am laying out a 9x11-inch laminating pouch with individual pieces of the pin image. I use just a touch of the glue stick to give the back of the pin image just enough stickiness to stick to the laminating plastic. I created this cardboard graph-paper board to help me layout my pin images in precisely straight rows and columns--leaving just enough space between and above each pin for the clear laminating plastic that will frame each pin. Laying the images out in straight rows and columns make the job of cutting up the laminating plastic into individual pins much easier than if each pin has to be cut out by hand. If you don't have easy access to a laminating machine to melt and press your laminating sheets, then you will need to find a local outlet (such as Kinko's) who will do this for you (for a fee or the laminating may be included in the price of the laminating pouch). 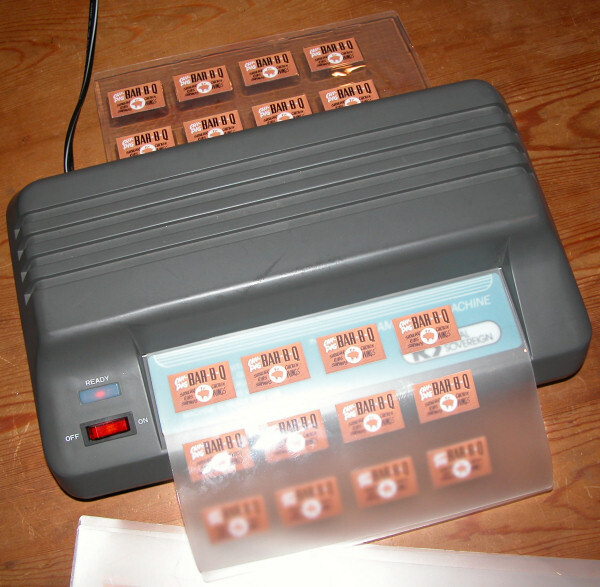 Here I am running a sheet of badges through my own laminating machine. Notice how the "milky" laminating plastic is a lot clearer after it has gone through the laminating machine and been fused together by heat. If you find yourself making a lot of these laminated pins and badges, you may want to get your own laminating machine. They come in various shapes, sizes, and prices. Don't rush into this. Do your homework before buying. Here I am using my cutting board, again. This time I am trimming and cutting the laminated sheets into columns (or rows) and then cutting each column (or row) into individual badges. You will find that cutting through laminated plastic is harder than cutting through paper, but the clear plastic also makes it easier to line up your cuts. You could also cut the individual badges out by hand using scissors. Scissor-cut lines are usually less than perfectly straight...but you may actually like how that looks. I use a small handheld mechanical paper punch to put holes in the laminating plastic. If I use one hole, the laminated badge will "dangle" from the safety pin. If I use two holes, and put the safety pin through both holes, then the pin is snuggly fastened to the clothes. Paper punches come in different sizes and make holes from 1/8-inch, to 3/16-inch to 1/4-inch. The 1/4-inch punch is the most common and easy to find, but I like to use a 3/16-inch punch for badges because the hole is smaller and doesn't require as much clear plastic above the image (i.e., gives me more choice and room). 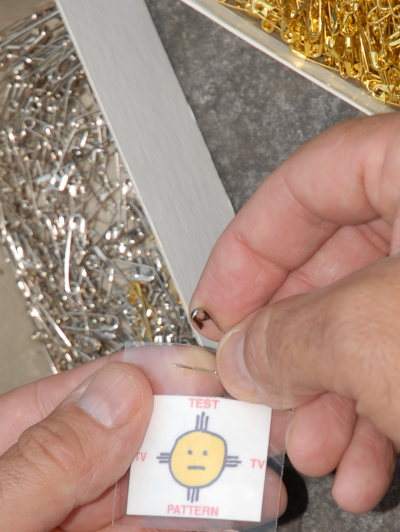 I like to use the smallest size hole punch--1/8-inch--to make the two holes for a pin. These smaller holes hold the safety pin more tightly insuring the pin won't slip sideways. The 1/8-inch hole punch, however, is the hardest size to find in retail stores. 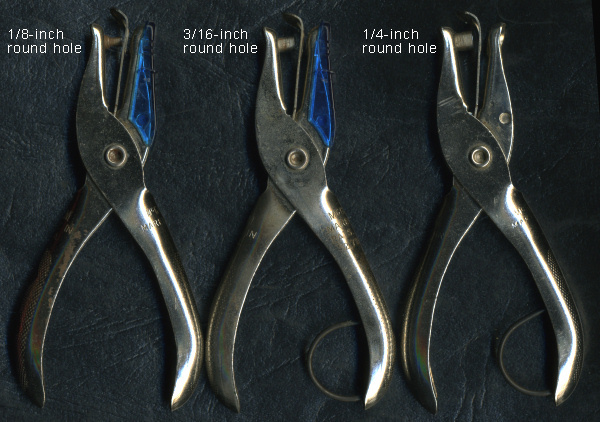 Hand hole punchers - three different hole sizes. When making badges, I use the paper punch to put one medium-sized round hole in the center at the top of the badge (in the the clear plastic above the image). I sometimes punch the hole off-center so the badge will hang at an angle. 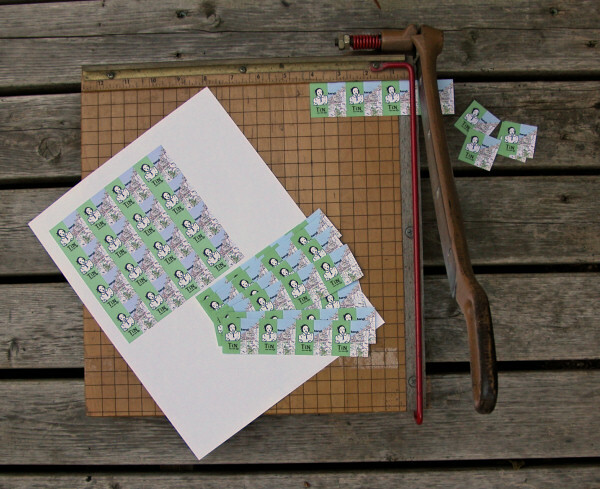 When making pins, I use the paper punch to put two small-sized round holes in the clear plastic at the top of the pin. The holes should not be too close, but also not further apart then about three-quarters the length of the safety-pin you are using. You can put the safety pin on the front of the pin and pin it to the cloth or you can push the safety-pin around and through the holes (revolve it from front to back through the holes) so it is on the back of the plastic rectangle. This style holds the pin out from the cloth and some people like this style better--some find it easier to use and affix to their clothes and the safety pin stays with the laminating plastic at all times). My own preference is the regular pin type with the safety pin on the front. It's simpler and easier to assemble. Your preferences may differ and may vary depending on the pin, the audience, and the project. All three fastening methods are illustrated in the picture below. Safety pins come in lots of different sizes. Size 2 is the most common. I like to use size 1 for my pins and size 1 or 2 for my badges. It depends on the size of the pin or badge and other considerations. Experiment and find your own size preference. Mostly, I use silver safety pins, but I have also used brass and even enameled safety pins. I use so many safety pins, that I now buy them only in bulk quantities. They are a lot cheaper to buy in bulk than in the small packaged amounts you typically find in craft or sewing stores. Step 6 - Wear it and hand them out! Although the creative process is (or should be) its own reward and pleasure, wearing these pins and badges out and seeing (or imagining) the reactions of others is also fun. Most people on the planet have never or rarely seen a laminated pin or badge before, so they are often impressed by the simplicity and novelty of it. Make a bunch of pins and hand them out to family, friends, and strangers! If you're like me, you'll like this game--you'll be thrilled to create, make and handout your own laminated images and statements as laminated badges and pins. You may also want to expand the game and 1. add these pins to your other art work or creative projects and/or 2. "package" these badges and pins up in their own little envelopes or paper folders--adding new meanings, references, and elements to your pins (and expanding this game and its possibilities). You can see some examples of the different things I have done with laminated pins by exploring what I have done with rock bands and other projects (the examples also include metal buttons I have created, too). Like all creative games, there are an infinite number of possibilities here and there will always be lots of new territory and possibilities to be explored (no matter what has been done before). If you find yourself taken with the idea of making these pins and you find yourself having lots of ideas for different ways to make these pins and different things to do with them, then welcomed to the club--this may turn out to be one of your creative games, too.